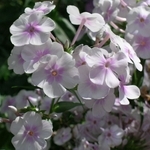 Phlox carolina 'Solar Flare' is a strong grower with a freely basal branching habit. Mid May through June you will be gifted with lots of sweetly fragrant 1¼" bicolor flowers that are white with a strong pink center marking in rounded panicles. The foliage is slightly glossy, pointed and possesses exceptional resistance to powdery mildew. 'Solar Flare' is the result of a cross of 'Minnie Pear' x 'Gypsy Love' by Charles Oliver . PP#27265.